Excitement, Frustration, Glory: The Olympics — Or Science? : 13.7: Cosmos And Culture There is a herolike narrative in science that is not that far from a sports narrative — the striving for success with the hope of bringing something unimagined to the field, says Marcelo Gleiser. 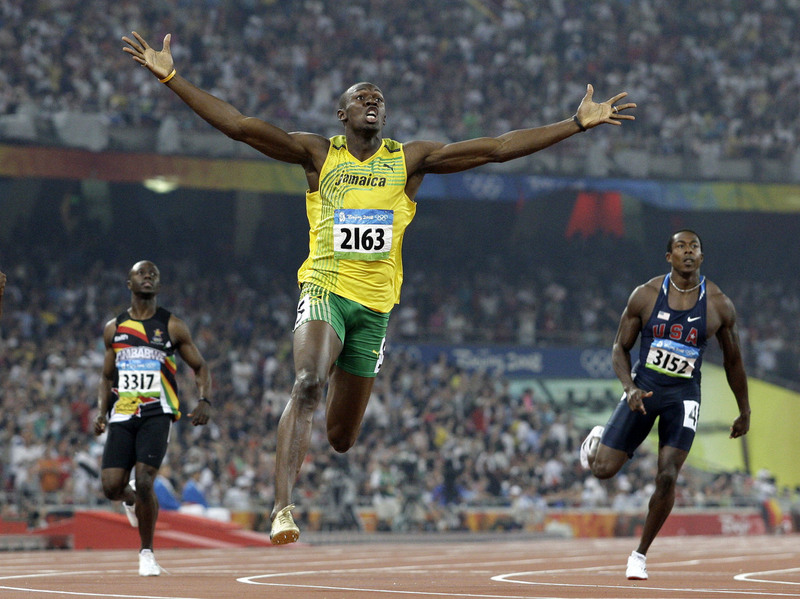 Jamaica's Usain Bolt crosses the finish line to win the gold in the men's 200-meter final during the 2008 Summer Olympics in Beijing. Sounds like the usual narrative of sports events: the long hours of training and complete devotion, the expectation of results that may define new records or new ways of looking ahead, the excitement preceding the meet. Then, when the time comes, it can be total frustration or glory. Equipment failure, miscalculations, human error; or triumph, new heights achieved, new horizons revealed, old records broken. There is a herolike narrative in science that, perhaps surprisingly, is not that far from a sports narrative. We strive for success, for new discoveries, for being the first in our fields, or, at least, for bringing in something new to the field, something no one else has done or seen before. We dedicate years, decades of our lives to learning the techniques of our specialties, communicating with our peers, learning from teachers and mentors (our coaches), always striving to become better at what we do, pushing the envelope, pushing our limits. As we mature, we learn that some of the youthful dreams were a bit too far-fetched, that we must settle for perhaps a bit less than being a groundbreaking scientist. There's only one Albert Einstein and Niels Bohr; there's only one Usain Bolt, one Michael Phelps, one Pelé. Still, not being the best should never stop anyone from being his/her best, from growing through the process of learning more about the world and about yourself in the process. You don't need to be a top athlete to be an athlete, as you don't need to be a top scientist to be a scientist. You run the best race you can, you measure your achievement based on realistic goals and expectations. In high energy physics, as in so many track and field modalities, new results are hard to come by. In track, records are hard to break, while in particle accelerators, high-luminosity collisions between particles (essentially, how many particles can be squeezed within two beams traveling in opposite directions so that the rate of collisions between particles in the beams is as large as possible) are hard to improve upon. Yet, new physics results depend on such improvements, as new track and field records depend on improved technique, discipline, dedication and equipment efficiency. In the world of high energy physics, the possible new world record, the promising bump in the Large Hadron Collider data that CERN scientists revealed in December — potentially a superheavy new particle with a mass 750 times higher than that of a proton — went away after more data became available. Between December and this summer, theoretical physicists wrote more than 500 papers trying to figure out what this hypothetical bump could be, assuming it was real. The promise of new revelations about the hidden workings of nature was the main motivator here as, of course, was the more personal glory of having figured out something that no one else had. Still, the bump is not there, and a hard lesson was learned. Even a very rare statistical fluctuation (the hypothetical bump) can prove to be just that, a rare statistical fluctuation without any deeper meaning. There is a lesson of humility for everyone here, as there's a lesson of humility to any athlete who doesn't make it to the podium or, when it comes to the great ones, to know that sooner or later someone else will beat you. In the end, everyone that threads the hero's path earnestly will share the same feelings of excitement, frustration and glory, even if the paths are as different as the 100-meter dash and the search for a new particle of nature.